Program is a set of instructions. We know that each instruction of the program is executed by processor. Processor executes instructions one by one. What ever we write in our program will be executed in the same order as they appear in the program. So we can say processor execute instructions in a sequential manner. At a particular instant processor is executing some line of code, we say control of processor is on that line. Processor’s control moves from one line to another. We say this movement of processor control goes in sequence. Processor control moves in a sequential manner. We have to do nothing to implement sequence control instruction. This is just a concept that your program always run in a sequence. Decision control instruction is also known as selection control instruction. As the name implies the job is selection control instruction is to select a set of code for execution on the basis of some condition. if is a keyword which let compiler to identify decision control instruction. Immediately after if some condition is there. This condition is any valid expression in C. If the result of expression is non-zero it is considered as TRUE otherwise FALSE. Immediately after this condition there is a block of code. Since this block is immediately after if, it is known as if block. Whatever we write in if block will be execute only when condition is TRUE. When condition is false control skip if block and execute statements written after if block. Constructing the body of "if" statement is always optional, Create the body when we are having multiple statements. For a single statement, it is not required to specify the body. If the body is not specified, then automatically condition part will be terminated with next semicolon ( ; ). In this program output depends on the value given by user. Variable marks hold the value entered by user. We have used two if statements. 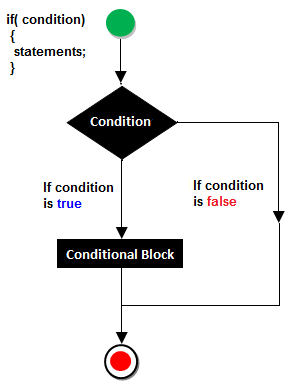 In the first if statement we use the condition marks>=33, thus if the marks are greater than or equal to 33 condition becomes TRUE, so if block executed, otherwise if block is skipped. Whatever may the result of first if condition, control has to reach second if statement. If marks are less than 33 condition will be TRUE and execute if block otherwise if block is skipped. The if...else statement executes some code if the test expression or some condition is true (nonzero) and some other code if the test expression or some condition is false (0). If some condition is true, codes inside the body of if statement is executed and, codes inside the body of else statement is skipped. If some condition is false, codes inside the body of else statement is executed and, codes inside the body of if statement is skipped. You can use if statement without else block but else must have paired with if. Else block should appear immediately after if block otherwise an error occurred during compilation. The same program was discussed using only if statements. This one is refined version of program and hence better than that of the previous one. 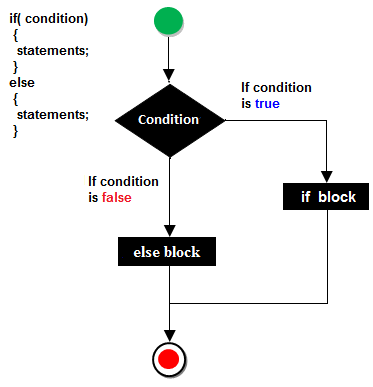 Notice that, there is only one condition need to be evaluated, if the condition is TRUE if block will work otherwise else block will be executed. Note: If there is only one statement in if block then mentioning block using curly braces is optional. Same rule is applied to else block. It is also known as ternary operator which means operator need three operands to perform its operation. Expression 1 is a condition, which is first evaluated as TRUE or FALSE. If the condition is TRUE executes expression2 otherwise execute expression3. Conditional operator works similar to if-else, but we do not have to use keyword if and else. In this program user enters two numbers which is then get stored in x and y. Notice the last line of the program that is conditional operator, which is used to select one from the two printf() statements. If x>y then value of x get printed otherwise value of y is printed. In this program conditional operator is used to select one from x and y to assign value of either x or y in variable max.